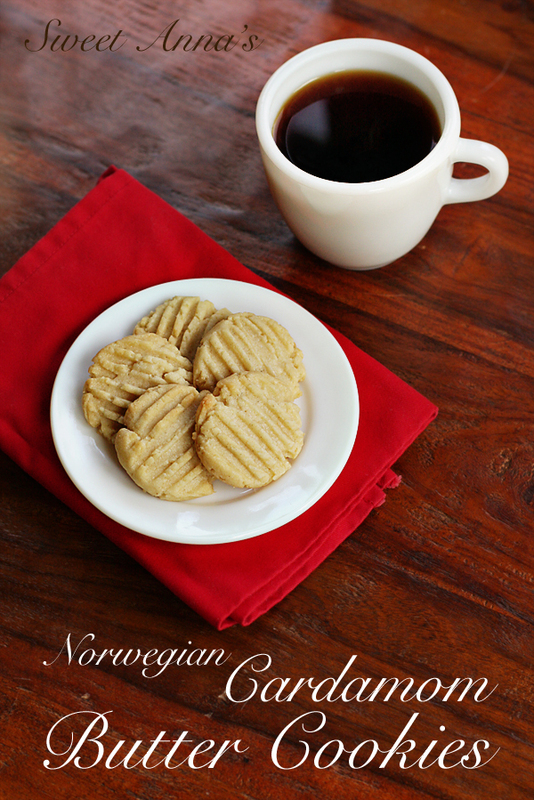 One of my all-time favorite cookies growing up was my grandma’s Sandbakkelse (Norwegian Almond Butter Cookies). If there wasn’t a fresh batch on the counter, you could always count on a bag or two hiding in the freezer in the basement. She was known (around the world!) for them. And hot out of the oven, or still slightly-frozen and dipped in a hot cup of coffee… there really was nothing better. This cardamom version of her famous buttery cookies is now tied right up there as my favorite. And I sure hope I made her proud with this one! If you like butter, and if you like cardamom, you will like these cookies. Cream together the butter and sugar until light and fluffy. Beat in the egg, vanilla extract, cardamom and salt until well blended. Mix in the flour, until you have a smooth, well-mixed dough. Scoop the dough out onto parchment-lined baking sheets. Flatten with a fork dipped in cold water.